Singer SE340 has good stitch quality and it is feature packed. But still, there are certain areas of improvement. Once it is fixed, SE340 will be perfect. Singer SE340 is very similar to the machine we previously reviewed, the Singer SE300. The machine needs a huge investment, so you need to be absolutely sure about its quality. SE340 was released in the later part of 2015 and it received quite a good response. Actually this machine currently costs quite a bit more than the SE300 model. Given the fact that both SE300 and SE340 has identical features, the question is what makes the later much more expensive? The answer lies in the accessories that you get with Singer SE340. With SE340 you will get an embroidery digitizing software which allows you to create your own designs. 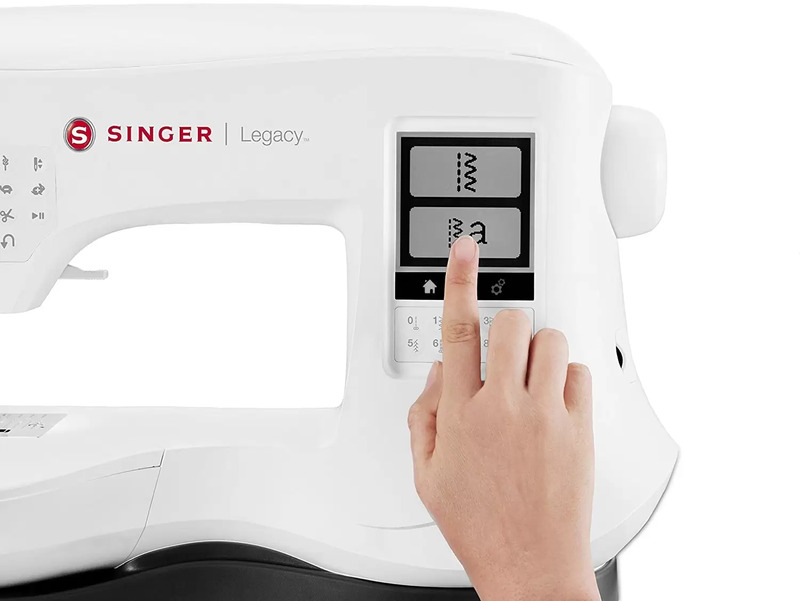 Singer SE340 is an advanced sewing and embroidery combo machine. In terms of looks, it is just plain awesome. Definitely it is one of the most beautiful sewing machines I have ever come across. As far as sewing stitches are concerned, it comes with 250 built-in sewing stitches. The stitches include 10 One Touch Basic Stitches, 8 Basic Stitches, 7 Stretch Stitches, 118 Decorative Stitches, 14 Fully-Automatic Buttonholes, 18 Satin Stitches, 23 Elongation Stitches, 22 Quilting Stitches and 30 Heirloom Stitches. The biggest advantage of SE340 is the large embroidery area on offer. You can easily accommodate large projects, thanks to the 10.25″ x 6″ embroidery area. In addition to 10.25″ x 6″ hoop, the machine also comes with a smaller 4″ x 4″ hoop. The thread tension is automatic for optimum results. The automatic needle threader is another time saver. There is an automatic thread cutter as well (cuts the top and bobbin thread with the touch of a button). The start/stop button and slow and fast sewing speed buttons helps you to sew without using the foot pedal. The slow speed is really slow, trust me. This will be handy for inexperienced sewers. Singer SE340 can sew at a maximum speed of 800 stitches/min and embroider at a maximum speed of 700 stitches/min. 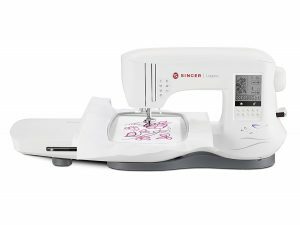 The sewing speed is just about acceptable, especially when you compare it with cheaper machines like the Singer 4423 which has a sewing speed of 1,100 stitches/min. The embroider speed of 700 stitches/min is really fast and I am very much impressed with it. The work area of SE340 is well lit, thanks to 3 LED bulbs. The LCD touch screen is where you will adjust the sewing and embroidery settings. SE340 comes with 200 embroidery designs plus 6 alphabet options. Out of 200 designs, only 69 embroidery designs come built-in the machine. The remaining 131 designs come in the USB stick that is included in the box. Select stitches on Singer SE340 can be mirror imaged. Stitches can also be made 3 times longer. The locking stitch buttons lets you secure the stitches. The programmable needle up/down feature literally works like an extra hand while quilting. The machine comes with an easy to load top drop-in bobbin. SE340 has a thread break sensor which sounds an error alarm when thread breaks or runs out. The machine has an independent bobbin winding system as well. SE340 has 29 needle positions and twin needle control. For free-motion quilting, drop feed is also available. The extra high presser foot lifter allows extra clearance for bulky fabrics. The Presser foot sensor ensures the presser foot is in the proper position. The built-in carry handle makes it portable. The machine is slightly on the heavier side, weighing around 18.6 pounds. The machine can be mounted into a sewing cabinet. As I have said earlier, the best thing about Singer SE340 is the software package that comes with it. You can get live software updates along with advanced editing softwares like AutoPunch, HyperFont and editing modules (which when bought separately will cost more). The machine also comes with 10 snap-on presser feet. Singer SE340 is a machine that includes a steep learning curve (it has to be said). You might have to deal with bird nesting and thread breaking initially, especially if you are not experienced. Once you get the threading and tension right, the machine will work flawlessly. Switch over from embroidery to sewing and vice versa must be done exactly as explained in the user manual, otherwise you might not get expected results (it might frustrate you). One touch buttons for commonly used stitches is a nice addition from Singer. You don’t need to enter the stitch number every time you need to use them. The stitch quality on SE340 is very good, especially the embroidery designs. Selecting designs that come on USB stick is very easy. Most of us are used to USB sticks on computers, it is not much different here as well. The LCD touch screen is responsive and easy to read. Digitizing your own designs using the included software will require a lot of patience. You should be prepared to play with it. But once you manage to get the designs stitched, there is no better feeling in the world. I am really impressed with the quality of designs (especially the detailing). The machine is very quiet while operating. The build quality of Singer SE340 is quite good. There is no overdose of plastic. The fact that the machine is heavy means that there is more metal inside (which is a good thing). There is no multihooping ability, which means you won’t be able to embroider designs larger than the available embroidery area. Singer could have included this, especially when machines like Singer Futura XL-400 which is almost half the price of this one, comes with multihooping. Some users have reported issues with the reverse sewing button. But I didn’t experience any such problems. The hoops could have been made of better quality material (it looks flimsy). The softwares are not Mac compatible. So Apple users will have to go elsewhere. I hope Singer will roll out Apple compatible softwares in future. As far as stitch quality and features are considered, Singer SE340 is a good option. However the machine is not without limitations.